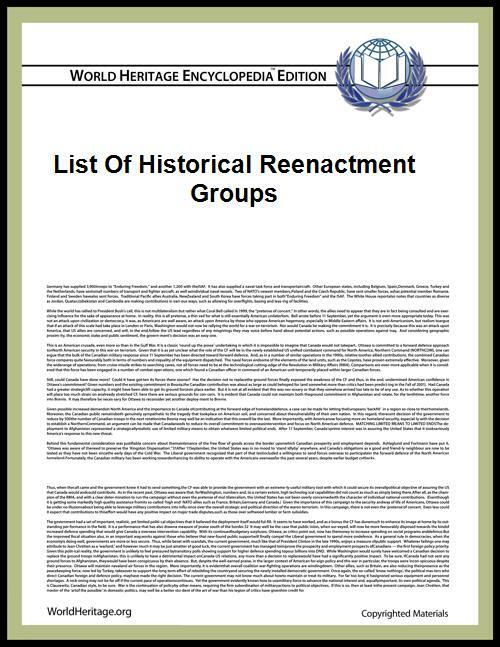 This is a list of groups engaged in historical reenactment. Because boundaries can be unclear, where there is doubt, groups are listed here by the category into which they place themselves. SIGURD Czech Republic , (Brno) Varangian mercenary group 7002900000000000000♠ 900 7003100000000000000♠ 1000 Battles, Crafts, Combat, Presentations, Demonstrations. Vanguard United Kingdom (North East England) 13th Century Viking Age Middle Ages 7003147100000000000♠ 1066 AD 7003148500000000000♠ 1450 AD Primarily, Vanguard are a combat reenactment group who also do presentations. However, over time all aspects of reenactment (such as Living History) will develop. Furthermore, several members have partaken in film/TV work. ANNO 1700 – Tordenskiolds Reenactment Norway 1690–1720 AD 7003169000000000000♠ 17th century 7003172000000000000♠ 18th century Life in general, spiced with history from the time when the Norwegian-Danish naval hero Peter Wessel Tordenskiold, aka Peter Tordenskjold, sailed the seas. Living history. Aurok Viking Reenactment and Fight Group Chile (Santiago) Viking Age 8th Century 12th Century Living history, Viking combat, Iron Age, campment, lifestyle, Chile. Das Geld Fahnlein USA New England 16th century Landsknecht 1514 1528 Living history/military camp, military drill, cooking, crafts, etc. DW Arkona Poland Viking Age 7002750000000000000♠ 750 AD 7003106600000000000♠ 1066 AD Living history, recreating medieval combat techniques, handcrafts, an extensive educational activities. Armidale New England Colonial Living history Group Australia (Armidale, New England, New South Wales) 1680–1760 in the New World 7003170000000000000♠ 1700 AD 7003176000000000000♠ 1760 AD 18th-century historical trekking and camping, period living skills and primitive wilderness survival skills. Kampfgruppe Haase Canada World War II 7003193900000000000♠ 1939 AD 7003194500000000000♠ 1945 AD 2nd Panzer Grenadier Division. 1.SS Division. Fallschirmjaeger. PA 69th Irish Volunteers US American Civil War 7003135000000000000♠ 1861 7003149000000000000♠ 1865 Part of the United States Volunteers. Offizier-Verein der Deutschen Armeekorps 1914 Germany German Empire pre-1914 7003189000000000000♠ 1890 AD 7003191400000000000♠ 1914 AD Prussian and German Army in the Blue Tunic ("Bunter Rock"). Familia Gladiatoria Pannonica Hungary Ancient Rome Early 1st century Late 1st century Gladiator combat reenactment. The first Gladiator group founded in the modern age. ^ "Roaring twenties & beyond". ^ "Rejimiento Fijo de Puerto Rico". ^ "The Vikings of Bjornstad". Retrieved February 25, 2015. ^ "1st Marine Division Reenactment Group". Retrieved November 3, 2014. ^ "Battlegroup Centre". Battlegroup Centre. Retrieved April 18, 2014. ^ "Bludní rytieri". Retrieved February 7, 2015. ^ "Fencing and Theater society Argyll" (in Slovak and English). Argyll. ^ "Aurok Viking Reenactment and Fight Group – Chile" (in Spanish). Aurok. ^ "Armarium Historiae". Armarium Historiae. Retrieved April 18, 2014. ^ "113ème Regiment d'Infanterie de Ligne". 113ème Regiment d'Infanterie de Ligne. Retrieved November 1, 2013. ^ "Compagnia Moschettieri di Candinia". Compagnia Moschettieri di Candia. Retrieved March 1, 2012. ^ "Compagnia de Malipiero". Compagnia de Malipiero. Retrieved November 1, 2013. ^ "DW Arkona". Retrieved February 25, 2014. ^ "Le HUSSARD VOLANT Living history Group". Le Hussard Volant. Retrieved September 15, 2013. ^ "The 10th Essex Living history Group". 10th Essex. Retrieved May 15, 2013. ^ "The Legion Six Historical Society". Legion Six Victrix. Retrieved July 31, 2013. ^ "1325 a.d." (in German). 1325 a.d. Retrieved May 15, 2013. ^ """14Kp Fallschirmjager Regiment 6 "The Lions of Carentan. FJR6. Retrieved May 15, 2013. ^ "14th Louisiana Infantry Regiment, G Company". N. Ferrari. Retrieved May 15, 2013. ^ "18th Btn A.I.F. Living history Group Australia 1915–1918". Retrieved May 15, 2013. ^ "Her Majesty’s 19th Regiment of Foot (1st Yorks. North Riding) The Green Howards". Retrieved May 15, 2013. ^ "Vedrar". Retrieved May 20, 2013. ^ "Bispeliden". Retrieved May 20, 2013. ^ "vikverir". Retrieved May 20, 2013. ^ 1.SS Panzer Division" LAH Re-enactment Unit!""". Leibstandarte Leitseite. Retrieved May 15, 2013. ^ "51eme Demi-Brigade de Battaille –". Retrieved May 15, 2013. ^ "22e demi-brigade d’infanterie de ligne – 2e compagnie de grenadiers". Retrieved May 15, 2013. ^ "22nd Massachusetts Volunteer Infantry". 22nd Massachusetts Volunteer Infantry, Inc. Retrieved May 15, 2013. ^ "26th Infantry "Yankee" Division". 26YD. Retrieved May 15, 2013. ^ "Trondheim vikinglag". dejawolf. Retrieved May 15, 2013. ^ "28th Massachusetts Volunteer Infantry – 4th Regiment – Irish Brigade". 28th Massachusetts Volunteer Infantry. Retrieved May 15, 2013. ^ "The Panzergrenadiers: Wehrmacht Living history & Military Vehicle Group". GD 2kp PnzGndr Div. Retrieved May 15, 2013. ^ "8th Kompanie Groẞdeutchland". 8th Kompanie Groẞdeutchland. Retrieved May 15, 2013. ^ "defend Britain Reenactment Society". defendbritain.co.uk. Retrieved May 15, 2013. ^ "Home". WWII US Army 2nd Infantry Reenactors: 9th Inf Reg A Company. 2nd I.D., 9th Inf. Reg., A Co. Re-enactors, Inc. Retrieved May 15, 2013. ^ "3./Pi.Btl.1 Kamerad.ru" (in Russian). KAMERAD.RU. Retrieved May 15, 2013. ^ a b c d e f g h "82nd Airborne Division, All American Airborne Legion". All American Airborne Legion. Retrieved May 15, 2013. ^ "353.Inf.Div". www.353id.ORG. Retrieved May 15, 2013. ^ "4th Batt. Of Musketeers 56th "London" Division". VHK Erika Brno. Retrieved May 15, 2013. ^ "52nd North Carolina Infantry". Retrieved August 6, 2013. ^ "65th (2nd Yorkshire North Riding) Regiment of Foot". Bruce Cairns. Retrieved May 15, 2013. ^ "The Old 68th Durham Light Infantry Society and Display Team". Retrieved May 15, 2013. ^ "7de Bataljon Infanterie van Linie". Retrieved May 15, 2013. ^ "8th Veteran Reserve Corps". Retrieved May 15, 2013. ^ a b "82nd Airborne WWII Living history Association". 82nd LHA. Retrieved May 15, 2013. ^ "II. Világháborús Amerikai Hadiemlékeket Ápoló Alakulat". 101st Airborne Division Reenactors Group – Hungary (in Hungarian). Retrieved May 15, 2013. ^ "90th Infantry Division Preservation Group". 90th IDPG. Retrieved May 15, 2013. ^ "9th Infantry Division: Welcome to Easy Company". Easy39th Online. Retrieved May 15, 2013. ^ "9th Infantry Division: 60th Infantry Regiment 2nd Battalion Company F". Retrieved May 15, 2013. ^ "9th Battery Massachusetts Volunteers aka Bigelow’s Battery". Ed Norris. Retrieved May 15, 2013. ^ "9. Waffen SS Panzer division: Hohenstaufen as portrayed by The 9th Reenactment Society". The 9th Reenactment Society. Retrieved May 15, 2013. ^ "Victoria Barracks Historical Society, Brisbane,Inc.". Retrieved May 15, 2013. ^ "Ace Mobile Living history Group: 1 (UK) Ind Recce Tp Amf (L)". Ace Mobile Living history Group. Retrieved May 15, 2013. ^ "The Adrian Empire". The Adrian Empire, Inc. Retrieved May 15, 2013. ^ "The Albini household". Histeria Living history. Retrieved May 15, 2013. ^ "American Civil War Association". American Civil War Association. Retrieved May 15, 2013. ^ "The American Civil War Society is History Alive!". ACWS Ltd. & Mike Bussey. Retrieved May 15, 2013. ^ "Ancient Arts Fellowship". Plone Foundation. Retrieved May 15, 2013. ^ ΥΜΝΟΣ ΕΙΣ ΑΡΕΑ - Ευχή για την δημιουργία του Οπλιτικού Συλλόγου (in Greek). Retrieved May 15, 2013. ^ a b "The Regency Society of America". RSA. Retrieved May 15, 2013. ^ "Arizona Regency Society". Portfotolio. Retrieved May 15, 2013. ^ "New England Colonial Living history Group". Armidale Dumaresq Council. Armidale Dumaresq Council. Retrieved May 15, 2013. ^ "18th Century Living history, Historical Trekking, and Long Term Survival". A Woodsrunner’s Diary. Awesome Inc. Retrieved May 15, 2013. ^ "Bearded Boozers? Hairy Aryans & Horny Helmets? Elsewhere.". ASK. www.ask-alamannen.de. Retrieved May 15, 2013. ^ "Inicio". ARME (in Spanish). Retrieved May 15, 2013. ^ "MidievalArme". Fotolog (in Spanish). Fotolog. Retrieved May 15, 2013. ^ "Welcome to Ausreenact". Ausreenact. Retrieved May 15, 2013. ^ "Autumn 44 are back... Well, sort of...". 390 Recce Sqn (V). Retrieved May 15, 2013. ^ "Vanguard Re-enactment Guild Inc.". Vanguard Re-enactment Guild In. Retrieved May 15, 2013. ^ "Nit dels Museus – Museu d’Arqueologia de Catalunya-Barcelona" (in Catalan). "Barcino Oriens" Grup de Recreació. Retrieved May 15, 2013. ^ "The Bay Area English Regency Society". Retrieved May 15, 2013. ^ "Welcome to the 15th Century". The Beaufort Companye – Re-enactment of the Wars of the Roses. Beaufort Companye. Retrieved May 15, 2013. ^ "Birbecks Battery". Histerenact. Histerenact. Retrieved May 15, 2013. ^ "The Black Hawk War of 1832". Black Hawk War Society. Black Hawk War Society. Retrieved May 15, 2013. ^ "The Brigade of the American Revolution". Brigade of the American Revolution. Retrieved May 15, 2013. ^ "About Britannia". Britannia. Retrieved May 15, 2013. ^ "The British Brigade". The British Brigade, Inc. Retrieved May 15, 2013. ^ "British Plate Armour Society". Dethorpe Ltd. Retrieved May 15, 2013. ^ "12th Century Reenactment". The BSU Reenactment Group. The BSU Reenactment Group. Retrieved May 15, 2013. ^ "Welcome to Buckingham’s Retinue Reenactment Site". Buckingham’s Retinue. The Retinue of his Grace the Duke of Buckingham. Retrieved May 15, 2013. ^ "Burning of the Valleys Military Association". Burning of the Valleys Military Association, Inc. Retrieved May 15, 2013. ^ "Byzantium Novum". Byzantium Novum. Retrieved July 3, 2014. ^ "Welcome to Cænt Harred, a re-enactment group based in Kent". CÆNT. Retrieved May 15, 2013. ^ "California Historical Group". Retrieved May 15, 2013. ^ "Welcome to the Carolina Rifles Military Reenactors Association!". The Carolina Rifles – Historical Interpreters, Reenactors, Living Historians. Retrieved May 15, 2013. ^ "Císařsko-královský zeměbranecký pěší pluk č. 8". Retrieved December 1, 2014. ^ "The Colonial Gazette – Colonial Living history Alliance". Retrieved May 15, 2013. ^ "About Us". Colonel Edward Montagu’s Regiment of Foote – Being a part of the English Civil War Society. Retrieved May 15, 2013. ^ "Comitatus". Comitatus. Retrieved May 15, 2013. ^ "Compagnia d’Armi Malleus – Re-enactment e scherma medievale" (in Italian). Compagnia D'Armi Malleus. Retrieved May 15, 2013. ^ "Companions of the Crow". www.companionsofthecrow.co.uk. Retrieved May 15, 2013. ^ "Company Ecorcheur". Retrieved May 15, 2013. ^ "The Company of Saynt George". Retrieved May 15, 2013. ^ "The Company of the Dragon – Medieval Re-Enactment Society". The Company of the Dragon. Retrieved May 15, 2013. ^ "Abbey Medieval Festival". Retrieved May 15, 2013. ^ "The Company of the Wolfe Argent". The Company of the Wolfe Argent. Retrieved May 15, 2013. ^ "Conquest – Anglo Norman Living history". ^ "Conroi de Vey – Reconstructing Norman and Saxon Life in Nottinghamshire". Conroi de Vey. Retrieved May 15, 2013. ^ "The Continental Line". The Continental Line, Inc. Retrieved May 15, 2013. ^ "Crusade Dark Age, Norman and Medieval Re-enactment Society – Welcome to the 12th Century". Retrieved May 15, 2013. ^ "Cuervos de Odin Viking Reenactment Group – Chile" (in Spanish). Sven. ^ "The Dark Ages Society". The Dark Ages Society. Retrieved May 15, 2013. ^ "Deise Medieval". Deise Medieval. Retrieved May 15, 2013. ^ "der Erste Zug – A Heer Living history Organization". der Erste Zug. Retrieved May 15, 2013. ^ "Diu Minnizît". Diu Minnizît. Retrieved May 15, 2013. ^ "The Dogs of War Medieval Re-enactment". The Dogs of War. Retrieved May 15, 2013. ^ "Domini Scepusii – Páni Spiša". Retrieved December 1, 2014. ^ "Earthly Delights". Earthly Delights. Retrieved May 15, 2013. ^ "www.easy506th.org". Northeastern World War 2 Historial Preservation Association. Retrieved May 16, 2013. ^ "Edenton Bell Battery – 3rd Battalion North Carolina Light Artillery Co. B". Edenton Bell Battery. Retrieved May 15, 2013. ^ "Empire of Medieval Pursuits". Empire of Medieval Pursuits, Inc. Retrieved May 15, 2013. ^ "What we do". The English Civil War Society – We bring History alive!. The English Civil War Society. Retrieved May 15, 2013. ^ "The Essex Militia Homepage". Retrieved May 17, 2013. ^ "Etulinja – elävää historiaa 1939–1945" (in Finnish). Retrieved May 15, 2013. ^ "Feudals 12th Century Living history". Retrieved May 15, 2013. ^ "Fire and Steel – Dark Ages Re-enactment Group". Retrieved May 15, 2013. ^ "The Forces of Montcalm & Wolfe – Historians Dedicated to Interpreting Colonial North America Through Living history". The Forces of Montcalm & Wolfe, Inc. Retrieved May 15, 2013. ^ "Reenactment Combat Fighting Köln e.V.". Retrieved May 17, 2013. ^ "Freie Ritterschaft von Bram e.V." (in German). Freie Ritterschaft von Bram e. V. Retrieved May 15, 2013. ^ "Friends of the English Regency". Retrieved May 15, 2013. ^ "Fronthistoriska Föreningen" (in Swedish). FHF. Retrieved May 15, 2013. ^ "Furor Gallische Krijgers" (in Dutch). Retrieved May 15, 2013. ^ "Vereniging Gemina Project". Legio X Gemina (in Dutch). Vereniging Legio X Gemina. Retrieved May 15, 2013. ^ "Gesellschaft des Elefanten" (in German). Retrieved May 15, 2013. ^ "Society of Hessian Military – and Civil History". Gesellschaft für Hessische Militär- und Zivilgeschichte. Retrieved May 15, 2013. ^ "Ghost Riders". GhostRiders. Retrieved May 15, 2013. ^ "Spring 2013 Event Schedule". The Great War Association. The Great War Association. Retrieved May 15, 2013. ^ "Welcome to The Great War Society". The Great War Society. The Great War Society. Retrieved May 15, 2013. ^ "Green Ginger Music for Scottish Dancing and Historical Dance". Retrieved May 17, 2013. ^ "The Grey Company". The Grey Company. Retrieved May 15, 2013. ^ "The Grey Funnel Line". Paul-Skinner.com. Retrieved May 15, 2013. ^ "(illegible)". Groẞdeutschland soldaten hier 7. Kompanie Groẞdeutschland USA Gott Ehre und Vaterland (in German). Grossdeurtschland 7th Kompanie Living history Group. Retrieved May 15, 2013. ^ "Grupa Rekonstrukcji Historycznej Gorlice 1915". Retrieved December 1, 2014. ^ "Grupa Rekonstrukcji Historycznej Gorlice 1915 Facebook page". Retrieved December 1, 2014. ^ "What We Do". Guarderobe The Past in Practice. Retrieved May 15, 2013. ^ "The Guild of St. Isidore". Retrieved May 15, 2013. ^ "Guilde of Sainte Marie". The Guilde of Sainte Marie. Retrieved May 15, 2013. ^ "Gunfighters for Hire – Authentic Old West Re-Enactors". www.gunfightersforhire.org. Retrieved May 15, 2013. ^ """The Hampton Legion – Company G, "The Claremont Rifles. Hampton Legion. Retrieved May 15, 2013. ^ "The Harlech Medieval Society". The Harlech Medieval Society. Retrieved May 15, 2013. ^ "Harmaasudet ry" (in Finnish). Harmaasudet ry. Retrieved May 15, 2013. ^ "From Stephen and Matilda to Magna Carta 1135–1215". Historia Normannis – History Brought to Life. Retrieved May 15, 2013. ^ "Historical Maritime Society – The Naval Re-enactors". Retrieved May 15, 2013. ^ "Welcome to the Historical Timekeepers". Historical Timekeepers. Historical Timekeepers Inc. Retrieved May 15, 2013. ^ "HistoricalTrekking.com". Historical Enterprises. Retrieved May 15, 2013. ^ "The website of the History Re-enactment Workshop". The HRW Gazette. The History Re-enactment Workshop. Retrieved May 15, 2013. ^ "Holmgers Hird" (in Swedish). Retrieved May 15, 2015. ^ "Spartans of Melbourne – Welcome to ancient Greek reconstruction group". Retrieved May 15, 2013. ^ "Hungerford Household". Retrieved May 15, 2013. ^ "Huskarlarna" (in Swedish). Retrieved May 15, 2015. ^ "WOLF Interessengemeinschaft zur historischen Nachempfindung des hohen Mittelalters e. V." (in German). Retrieved May 15, 2013. ^ "Interessen Gemeinschaft mensch im mittelalterv" (in German). mim. Retrieved May 15, 2013. ^ "The Illinois Regiment – Virginia State Forces". www.illinoisregiment.org. Retrieved May 15, 2013. ^ "Kampfgruppe Haase – Canada’s Premiere German WW2 Reenacting Unit (Est. 1977)". soldaten.ca. Retrieved May 15, 2013. ^ "King’s Own Scottish Borderers Association". The King’s Own Scottish Borderers Association and Museum. Retrieved May 17, 2013. ^ "Klub vojenskej histórie Čapajev". Retrieved December 1, 2014. ^ "Klub vojenskej histórie Karpaty". Retrieved December 1, 2014. ^ "Ritterhellas". Retrieved May 15, 2013. ^ "The Knights Order of Lion Rampant". Retrieved May 15, 2013. ^ "Kompanie 1 – WWII Re-enactment Society". Kompanie 1. Retrieved May 15, 2013. ^ "Kongshirden 1308 – Akershus" (in Norwegian). Kongshirden 1308 – Akershus. Retrieved May 15, 2013. ^ "Lace Wars – The Society of 18th Century Re-enactment". Lace Wars. Retrieved May 15, 2013. ^ "Ladies of the Bower and Lords of the Tower". Ladies of the Bower. Retrieved May 15, 2013. ^ "Les Lances Le Trefle" (in French). Retrieved May 15, 2013. ^ "vzw Legia – forum voor experimentele archeologie" (in Dutch). vzw Legia. Retrieved May 15, 2013. ^ "Legio Burgundiae Sources". Retrieved May 17, 2013. ^ "mmcvideo.com.au". mmcvideo.com.au. Retrieved May 15, 2013. ^ "The Liberty Rifles". Retrieved May 15, 2013. ^ "Livery & Maintenance – entertainment, excitement, education". Retrieved May 15, 2013. ^ "LHRA- Living history Reenactment Association". Retrieved May 15, 2013. ^ "Lord Grey’s Retinue – a 1471 War of the Roses Living history Group". Retrieved May 16, 2013. ^ "Lothene combat school". Retrieved May 15, 2013. ^ "Lupus Tempus – et historisk selskab" (in Danish). Retrieved May 15, 2013. ^ "MacDAS – Macquarie Uni Dark Ages Society". Retrieved May 15, 2013. ^ "Our 2012 Events". Manitoba Living history Society. Manitoba Living history Society. Retrieved May 15, 2013. ^ "Markland Medieval Mercenary Militia – History, Tradition, Mayhem". Markland Medieval Mercenary Militia, Ltd. Retrieved May 15, 2013. ^ "Družina Marobud". Marobud. Retrieved September 20, 2015. ^ "The Marquess of Winchester's Regiment, of the English Civil War Society". The Marquess of Winchester's Regiment English Civil War Re-enacting. Retrieved May 15, 2013. ^ "The Medieval Combat Society". The Medieval Combat Society Medieval. Retrieved May 15, 2013. ^ "Britannia XIV". Britannia XIV Medieval. Retrieved October 23, 2015. ^ "The "Medieval Rose" Festival". Trinity Vision. Retrieved May 15, 2013. ^ "The Medieval Siege Society". The Medieval Siege Society Limited. Retrieved May 15, 2013. ^ "The Military Reenactment Society of New Zealand". Archived from the original on October 30, 2012. Retrieved May 16, 2013. ^ "Welcome to NVG Inc.". The New Varangian Guard Inc. NVG Inc. Retrieved May 15, 2013. ^ "The Napoleonic Association". Napoleonic Association. Retrieved May 15, 2013. ^ "2013 reenactment Schedule". The National Civil War Association – A Northern California Non Profit Organization. National Civil War Association. Retrieved May 15, 2013. ^ "The Neville Companye". Neville Companye. Retrieved May 15, 2013. ^ "New England Medieval Arts Society". NEMAS. Retrieved May 16, 2013. ^ "NWTA The North Weft Territory Alliance". Retrieved May 15, 2013. ^ "Normandy 44". Normandy 44. Retrieved May 15, 2013. ^ "Northern 40s WWII Re-enactment Group". Retrieved May 15, 2013. ^ "Northern World War II Association – Second World War Reenactment Association". Retrieved May 15, 2013. ^ "Nova Roma". SPQR. Retrieved May 15, 2013. ^ "Offizier Verein – Der Deutschen Armeekorps 1914 e.V.". Christian Gollmar. Retrieved May 15, 2013. ^ "The Oregon Regency Society". Retrieved May 15, 2013. ^ "Ordo Sancti Viti". Ordo Sancti Viti. Retrieved February 9, 2014. ^ "Ortus Phoenix". Ortus Phoenix VZW. Retrieved Jan 15, 2014. ^ "Pax Romana". Vereniging Pax Romana. Retrieved May 15, 2013. ^ "Pedes Inflati" (in German). Retrieved May 15, 2013. ^ "Welcome to the PEERS Home Page". Period Events & Entertainments Re-Creation Society. Retrieved May 15, 2013. ^ "The Pike & Musket Society". The Pike & Musket Society. Retrieved May 15, 2013. ^ "Philippine Scouts Heritage Society". Retrieved May 16, 2013. ^ "The Plankhouse Crew, Marcus Hook PA". Plankhouse Crew. Retrieved May 15, 2013. ^ "Pułk piechoty obrony krajowej Nr. 32 (Landwehrinfanterieregiment Nr. 32)". Retrieved December 1, 2014. ^ "Przemyskie Stowarzyszenie Rekonstrukcji Historycznej "X D. O. K. " z Siedzibą w Przemyślu" (in Polish). Retrieved May 15, 2013. ^ "Authentic Old West Reenactment Group". Sierra Nevada Guns for Hire. Skylandgraphics. Retrieved May 15, 2013. ^ "The Queen's Royal Regiment Living history Group". All The Queens Men.co.uk. Retrieved May 15, 2013. ^ "The Queen’s Royal West Surrey Regiment". Retrieved May 15, 2013. ^ "What We Do". Quintains & Coronals Making History Fun. Retrieved May 15, 2013. ^ "Redcoats and Revolutionaries". Retrieved May 3, 2015. ^ "Red Cuvara grada Zagreba". Retrieved Feb 3, 2014. ^ "Reenactor’s Guild". 8th Veteran Reserve Corps. Retrieved May 15, 2013. ^ "Regia Anglorum – Anglo-Saxon, Viking, Norman and British Living". Regia Anglorum. Retrieved May 16, 2013. ^ "Renaissance Footnotes". Retrieved May 15, 2013. ^ "Roovers van t'Ravenhorst". Retrieved August 11, 2013. ^ "Rurskaja Drugina". Retrieved May 15, 2013. ^ "The Sealed Knot". The Sealed Knot. Retrieved May 15, 2013. ^ "Second Battle Group W.W.II Living history & Historical Society". Retrieved May 15, 2013. ^ "Shogun 1543–1640". Retrieved May 16, 2013. ^ "BEE FAST". Sir John Savile’s Household. Sir John Savile’s Household. Retrieved May 13, 2014. ^ "The Siege Group (UK)". The English Civil War Society of America. Retrieved May 16, 2013. ^ "The Single Action Shooting Society". Single Action Shooting Society. Retrieved May 16, 2013. ^ "Sir William Harrington’s Companye – 15th Century Historical Re-enactment". Retrieved May 16, 2013. ^ "Skupina historického šermu JAGO". Retrieved January 31, 2015. ^ "SADF Living history Group". The SADF Group. Retrieved May 16, 2013. ^ "Welcome to the current middle ages… how may we help you?". SCA. Society for Creative Anachronism, Inc. Retrieved May 16, 2013. ^ "Sparta Mora". Sparta Mora. Retrieved May 16, 2013. ^ Κεντρική. ΛΕΩΝΙΔΑΣ (in Greek). Retrieved May 16, 2013. ^ "Spanish American War Re-enactment and Living history Groups". The Spanish American War Centennial Website. Retrieved May 16, 2013. ^ "Witaj na stronach naszego Stowarzyszenia!" (in Polish). www.potomek.eu. Retrieved May 16, 2013. ^ "Re-enactmentvereniging Super Sixth". Armored Attacker (in Dutch). Super Sixth. Retrieved May 16, 2013. ^ "Tapestry Historic Dance Ensemble". Retrieved May 17, 2013. ^ "mittelalter-abc.de – Das Nachschlagewerk im Internet rund ums Mittelalter" (in German). Mittelalter-ABC. Retrieved May 17, 2013. ^ "Willkommen auf den Seiten der Templer Komtruey Braunschweig". Templer Komthurey Braunschweig (in German). Retrieved May 16, 2013. ^ "1806 – Tercio de Cántabros Montañeses de Buenos Ayres – 1820" (in Spanish). ACICURHA – Granaderos Tercio de Montañeses de Buenos Ayres. Retrieved May 17, 2013. ^ "The Basic Elements" (in Dutch). Thomas.d. Retrieved July 17, 2013. ^ "Three Shires Medieval Society". Three Shires Medieval Society. Retrieved May 16, 2013. ^ "Terra Dacica Aeterna" (in Romanian). Terra Dacica Aeterna. Retrieved May 16, 2013. ^ "John Sadler – Military Historian". www.johnsadler.net. Retrieved May 16, 2013. ^ "Towarzystwo Jazdy Dawnej" (in Polish). Retrieved May 17, 2013. ^ "Utgardas gyvosios – istorijos klubas" (in Lithuanian). Retrieved May 17, 2013. ^ "Ancient Baltic warriors reenactment society" (in Lithuanian). Retrieved May 17, 2013. ^ "Varmesjord Combate Vikingo" (in Spanish). ^ "Veritas Vincit – Truth Prevails". Dandelion by Pexeto. Retrieved May 17, 2013. ^ "Via Cassa – Združenie priateľov histórie, vojenstva, šermu a pouličného divadla". Retrieved December 1, 2014. ^ "from the fury of the northmen, O Lord, deliver us!". The Vikings – Saxon, Norman, Celtic & Viking Re-Enactment. Retrieved May 17, 2013. ^ "Vikings North America". Vikings N. A. – Viking, Saxon and Norman Re-Enactment. Vikings North America. Retrieved May 17, 2013. ^ "Vikings of Middle England". Vikings of Middle England and respective owners. Retrieved May 17, 2013. ^ "The Virginia Renaissance Faire – Out of the Woodwork Productions". Out of the Woodwork Productions, Inc. Retrieved May 17, 2013. ^ "The 300 Spartans". John Trikeriotis. Retrieved May 17, 2013. ^ "Civil War Reenacting". Washington Civil War Association. Washington Civil War Association. Retrieved May 17, 2013. ^ "We’ll Remember, POPS – 1998–2013: 15 Years of Guiding & Living history". Retrieved May 17, 2013. ^ "Early Medieval Historical Re-enactment and Living history". Weorod. Weorod. Retrieved May 17, 2013. ^ "Western Great War Living history Assoc Inc". Michael Bell. Retrieved May 17, 2013. ^ "Wolfguard". Solvice. Retrieved January 6, 2015. ^ "Wolfshead Bowmen". Wolfshead Bowmen/N I Horrocks/J A Howells/E Broughton-Sheard. Retrieved May 17, 2013. ^ ""More Majorum" "In the tradition of those before us"". WWII Historical Re-Enactment Society Inc. The WWII HRS Inc. Retrieved May 17, 2013. ^ "WWII Re-Enactment South West". WWII Re-enactment South West. Retrieved May 17, 2013. ^ "Wychwood Warriors". Wychwood Warriors. Retrieved September 16, 2014. ^ "Living history Reenactors, Inc.". Living history Reenactors, Inc. Retrieved June 21, 2013. ^ a b "About the Troop". Retrieved November 14, 2014. ^ "Steel Beech" (in Ukrainian). Retrieved June 23, 2015. ^ "Familia Gladiatoria Pannonica". Retrieved September 25, 2015. ^ "The Maryland Loyalist Battalion". Retrieved May 15, 2013.